Includes authoritative, up-to-date chapters by thirty-five contributors from around the world on topics ranging from evolution to biotechnology. The first half of the book provides a thorough overview of cactus biology and morphology and discusses the environmental and conservation issues that affect the plants. It includes a discussion of the evolution of the family, paying particular attention to new genetic and molecular approaches. 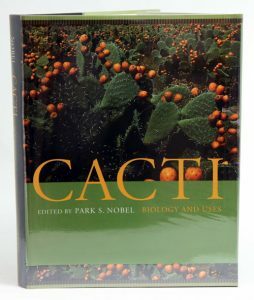 The second half of the book focuses on the practical concerns of cultivating cacti, such as pest control and diseases, horticultural and forage applications, and techniques for agronomy. Other chapters cover the different markets for cacti and products that are made from them. Feral opuntioid cacti in Australia: part I. cylindrical-stemmed genera: Austrocylindropuntia, Cylindropuntia and Corynopuntia. Journal of the Adelaide Botanic Gardens Supplement 3 (2015). 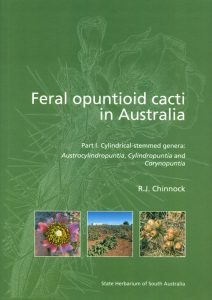 The State Herbarium of South Australia has now published the first part of Bob Chinnocks revision of weedy cacti in Australia. Artist/Author: Schulz, Rudolf and Attila Kapitany. Little information on the environment in which cacti naturally grow has ever been available to collectors and growers of cacti. This book, while mainly written for more experienced collectors of cacti who wish to know more about the much prized genus Copiapoa, should also appeal to beginning collectors of cacti and lovers of nature who wish to understand cacti in their dry, often desert, environments. The second part of the book contains specific information obtained from fieldwork undertaken by the authors during 1994 and 1996. Specific populations between El Cobre and Chañaral are investigated for density, health, variability, soils, fruiting, seed production, and more. Other cacti and succulents that co-exist with Copiapoas are also covered. Populations investigated and photographed are documented as to their precise latitude and longitude so that in future years researchers can return to the same sites for further studies. 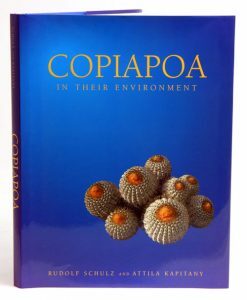 All of the content is written to help the reader understand how Copiapoas survive in their harsh surroundings and to give an appreciation of the fragility and special nature of their environment. 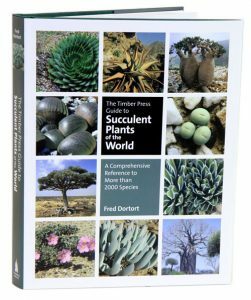 Timber Press guide to succulent plants of the world: a comprehensive reference to more than 2000 species. The plants are organized into 28 intuitively logical groups, such as succulent euphorbias, mesembryanthemums, bulbs, succulent trees, aloes, agaves, and haworthias. Each entry includes information on the plant’s native habitat, its cultivation requirements, and its horticultural potential. As useful to novice growers as to collectors and those with an existing interest in succulents, this will be the standard reference for years to come. 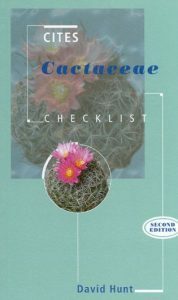 Includes alphabetic listing of Cactaceae names in current usage; reference data; and names of accepted taxa listed by countries.